Even if you have the best of the house, best of the interiors, and best of the location, it wouldn't be called a great home if the ambiance isn't good and the surrounding is full of noise. Working as a soundproof consultant over a decade has helped me to not only understand the basics of the soundproofing but also supported me to develop the insight. Even in the developed country such as the United States lacks the awareness about the soundproofing and the ill-effect of noise. Noise is like a "slow and sweet" poison. You should be well aware of the fact that continuous exposure to high level of noise can lead to stress, anxiety, loss of hearing, sleeplessness etc. I have spent early days of my life in the suburbs and, I still miss the silent environment, beautiful backyards, and of course my morning coffee. It is my long-time wish to go back to my village after retirement. Now, it's more than a decade in the metro, there is a beautiful backyard beside my apartment but it has totally lost its importance. We don't go in the backyard to spend some time with nature. I tried having a cup of coffee in the backyard, but the unbearable traffic noise made it impossible for me to even stand in the backyard for some time. Unfortunately, my bedroom is also facing the same problem of unwanted ear-piercing noise. As a soundproof consultant, I know that If I can soundproof my bedroom, the noise will not create any problem. But, I also wanna enjoy the beauty of my backyard. I want to have my morning tea right in the middle of the backyard. So, I decided to find the cheapest way of soundproofing backyard as well as the bedroom. Being honest, this post is the synopsis of all the things that I did to achieve a quiet environment in the bedroom as well as in the backyard. I'll divide the entire post into two sections to make things simple. We will talk in-depth about both of them. I will try to share all the knowledge that I gained during the project. Here, I would like to highlight that soundproofing the backyard will be an added advantage for the bedroom. I first opted for soundproofing the backyard, and then I moved to soundproof my bedroom. I have helped hundreds of my clients when it comes to soundproofing an apartment, but I wasn't having good hands on experience on soundproofing the backyard. Needless to say, I had done a few projects where I had to soundproof the backyard, but those houses were in the valley, and so soundproofing the backyard wasn't a tedious task for me. In fact, a very common and easy solution to make your backyard free from the traffic, and other unwanted noise. So, the question is, "how it works?" 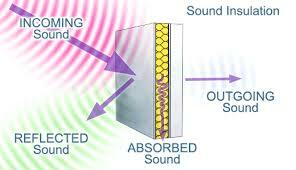 In this method, soundproofing materials are used as blockades to absorb the noise rather than to deflect it. Attenuation is defined as the loss of energy of the sound waves, and when this concept is applied in your backyard, it sounds to your ears as dampening of the noise. You may have a question in mind, if attenuation can dampen the noise, then what's the need of sound deflection, right? Well, the doubt is genuine, and I also had a similar doubt when I was starting out. To be precise, different materials respond differently to the sound waves, and there is a need for both attenuation and deflection for successfully soundproofing the yard. In the next section, we will talk about sound deflection which is more effective, but at the same time, costly and harder to implement. I gave sound attenuation the first try because this method is less expensive. However, I wasn't satisfied so I had to move to sound deflection which is a killer solution to unwanted noise. In this process also, we use blockades which isn't the same as the one we use for sound attenuation. The thickness and material used in the blockades decide its efficiency and success. Have you ever observed that we the sound wave hits the thick brick wall, it bounces back, and the brick wall doesn't vibrate for a second? Again, we are considering here the traffic noise. However, a thick wall will NOT perform effectively if the source of the noise is at a greater or even equal height to the fence that you have built to counter the unwanted noise. At the same time, a flexible barrier will vibrate when the sound wave will try to pass it, and this vibration may further lead to unwanted noise. I have experimented with quite a number of fences and walls. Some gave me astonishing results while the others weren't up to the mark. Anyways, I am planning to write a detailed article on soundproof fences in the future. So, we are done with the concepts that you can literally use to soundproof your backyard. 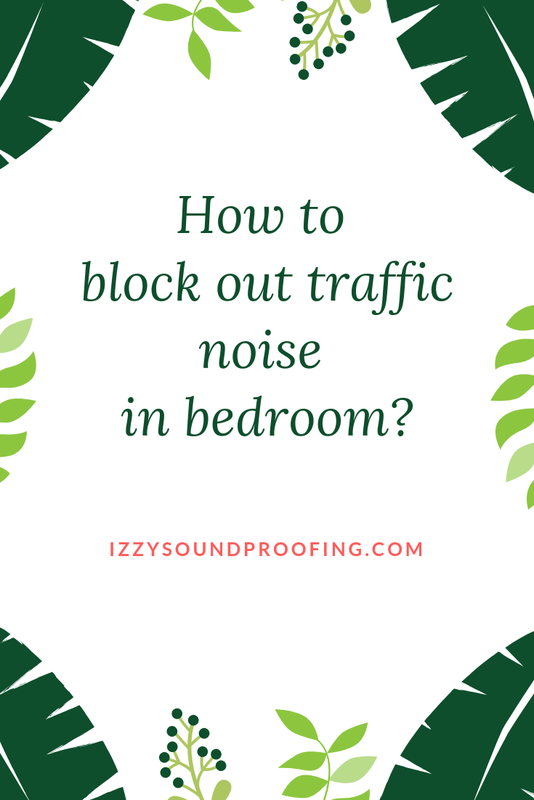 If you are having a doubt like, "How soundproofing can help me block out traffic noise in the bedroom? ", then allow me to explain it with an example. I will discuss three scenarios to bring some clarity on the benefits of the soundproofing your backyard. In this situation, it's also advisable to soundproof your backyard. It's less expensive, and it will almost negate the traffic noise. In most of the cases, I have found that my clients didn't have to go for soundproofing the bedroom if the backyard is treated acoustically. This one is a tricky affair. If your bedroom is on the first floor, then the acoustical treatment of backyard will be of great help ONLY if you increase the length of the fence to match your bedroom ceiling. Here, the height and thickness of the fence play a crucial role. If the height of the fence is less than the ceiling of your bedroom, then you will get a partial blocking of noise. If your bedroom is on the second floor or above, then it's better to soundproof your bedroom. If you will extend the height of the fence to that level, then the cost will be much more than soundproofing your bedroom. Anyways, it's finally you who has to take the decision. Moving further, I will explain you the cheapest ways to soundproof your bedroom. Again, you can block out the traffic noise in a bedroom using temporary or permanent methods. A white noise machine is a great example of the temporary solution to the traffic noise. However, you will be exposed to the traffic noise if you will switch off the machine. The white noise fans are favored over the white noise machines when it comes to sound dampening noise in the bedroom. Soundproofing your bedroom can help you to get rid of unwanted noise prevailing in your vicinity. The instant solution in the form of white noise fan/machine is a good choice if you don't have a budget for soundproofing your bedroom. However, I always recommend my clients to go for a permanent solution. I am going to discuss some of the cheapest ways to soundproof a room. When you are going for soundproofing your room, remember to concentrate on doors and windows. The doors and windows are key to success. It has been found that most of the unwanted noise enters the room via them. I have found many cases in which my clients used to overlook the windows. In fact, you should never do that mistake, and the good news is that soundproofing the doors and windows doesn't cost you a lot. If you will check the doors and windows carefully, you will find loads and loads of gaps and holes on the in and around the windows. At times, these gaps aren't visible with the naked eye. However, you can use a magnifying glass for this purpose. These bundle of small holes is capable of passing the air through it, and as the air is a carrier for sound, so sound can easily escape through these holes and vice-versa. You can weatherstripping tape or caulking for this purpose. Let's discuss them one by one. I prefer weatherstripping because of its cost-effectiveness. You can get 10m of these tapes for as low as $10. This length of the weatherstrip is more than enough to cover the windows and doors of your bedroom. So, in short, by spending $10 you can expect a sound result. However, this isn't a permanent solution. If you are tight on budget, and not in a position to spend $10, then I have a cheaper option for you. It's called Caulking. You can get it for almost 30 percent less price as compared to weatherstrip tape. There are many expensive version of it but I will recommend you to go for this product. It costs a few cents more than $6, and I can assure you that it will serve your purpose. Caulking is a permanent solution whereas the weatherstrip tape is a temporary solution. The process is quite simple. Caulking creates an additional layer of mass that can effectively block the airborne noise from passing through it. If needed, you can add an additional layer of it, but at the same time, keep a track of the functionality of the door or the window. I hope this video tutorial will help you in some ways. Soundproof curtains are among the cheapest ways to soundproof your bedroom. These thick curtains have a built-in layer of soundproofing materials that absorb the unwanted noise. If you are thinking that these curtains will be costly, then let me tell you that you can buy a descent soundproof curtain at as low as $15. I have found this soundproof curtain very useful in reducing the echo. Another feasible option is the moving blanket. These blankets are definitely worth every penny. I bought a few of them for shifting my furniture. Well, you heard it right. These moving blankets were manufactured with a motive to provide the furniture, home appliances etc an additional level of security during the shifting process. However, the thickness of these blankets and fabrics makes it a favorable choice for soundproofing. These budget-friendly blankets can be used for the purpose of soundproofing doors, windows, walls etc. To increase the sound absorbing capacity of these blankets, you can multi-fold it, and then hang it on the windows. On the downside, these blankets aren't as appealing as a normal curtain. To make it more appealing, you can decorate the blanket with the children drawing and many more things. I have seen a lot of my clients overlooking the floor. When I asked them, "Why aren't you interested in soundproofing floor?". The answer is shocking. They believe that the floor doesn't allow the sound to pass through it. But, the fact is entirely different. The low-frequency sound such as BASS can easily travel through the wall including floor and ceiling. For example, if your neighbor staying above you is moving the furniture, you will hear the voice, and this is possible just because noise is capable of traveling through the solid. 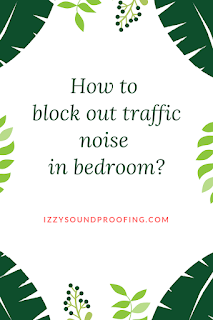 If you haven't soundproof the bedroom floor, then object falling on the ground or sound of footstep can create a lot of unwanted noise that you will definitely NOT want to hear during your sleep. Let's discuss some feasible options. Though carpets are mostly used for making your room prettier and warmer still you can use it for soundproofing purpose. The thicker the carpet the better they perform against the noise. When it comes to investment, you will NOT have to invest a lot to get a decent carpet that will serve your purpose. In case, you are looking for a budget-friendly carpet, then you can try this. The best thing about these carpets is that it helps the room to become a quieter place by NOT only absorbing the unwanted noise but also by negating the echoes that are caused due to the bouncing of the sound waves from the walls of the bedroom. To improve the soundproofing properties of the carpets, I would recommend you to use acoustic underlay The best way to use the underlay is to place it above the naked floor and below the carpet. This method is definitely helpful if you are having an echo problem in your bedroom. It will improve the quality of the sound. [Related]: How to soundproof a floor in an apartment? Soundproofing the ceiling of your bedroom can become a costly affair if you aren't using the correct soundproofing method and materials. We will discuss some cheap and effective methods that can help your bedroom to become a quieter place to sleep. However, these methods will not block the noise coming from outside rather they will absorb the noise that has entered your bedroom, and thus will improve the quality of the sound. Acoustic foam panels are made of soft sponge-like materials that are good at absorbing noise. You can get them for as low as $25. They have become very popular in soundproofing domain lately because of its budget-friendly pricing and effectiveness. On the downside, it may not be the prettiest sight that you will love to see when you wake up still they will add to your mental peace by reducing the noise in your vicinity. They are found in several shape and size so, choose the one that suits the decor of your bedroom. [Related]: Do bass traps work? Green Glue NOT only add to the security BUT also enhances the soundproofing properties of your bedroom. Though Acoustic foam is self-adhesive still I will recommend you to use Green Glue, it will NOT only add an additional layer of security but will also add to the soundproofing. If you are wondering, that it will cost you a lot, then let me tell you, it just cost as little as $20. Don't believe me? Check out the latest price here. The Green Glue is well known for its sound dampening properties in the soundproofing domain. Any and every room is surrounded by 4 walls, and there isn't any doubt that it is the biggest part of your bedroom that needs to be soundproof effectively. Falling to do so can ruin all your soundproofing efforts. I have written a detailed article on, "How to soundproof your existing wall?". Hope you will appreciate my effort. White noise machine is a device that produces white noise. There are a variety of uses of this machine. However, in the context of this post, it can be used to improve your sleeping. You can consider white noise playing in the background while you are asleep. Some machines come with a remote and timer so, you can also fix the timer for the machine. I have written a detailed article on white noise machine as well as white noise fan, and I hope it will be of great value to you. There are many other methods that you can use for blocking noise from reaching you. For example, noise canceling headphones and earmuffs can help you instantly to get rid of the traffic noise. Hope it helps. Well, in this post, we have discussed some of the effective ways to soundproof your bedroom. However, when I explain the same thing verbally to my clients, the next question they ask me, " How much will it cost?". I hope you will also have a similar question in your mind. I have written a detailed article on "How much does it cost to soundproof a room?" and, you can consider it as a reference to calculate the cost for soundproofing your bedroom. 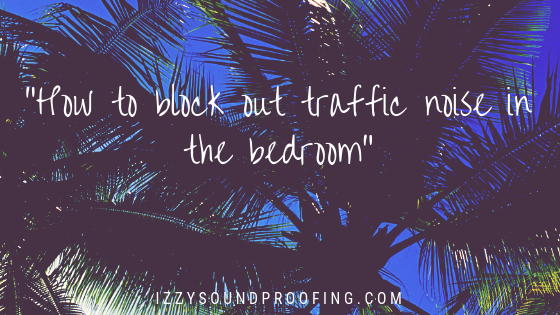 Last but not least, let us know your view on blocking traffic noise in the bedroom.